Girl with a Pearl Earring centers on Vermeer's prosperous Delft household during the 1660s. When Griet, the novel's quietly perceptive heroine, is hired as a servant, turmoil follows. First, the 16-year-old narrator becomes increasingly intimate with her master. Then Vermeer employs her as his assistant--and ultimately has Griet sit for him as a model. Chevalier vividly evokes the complex domestic tensions of the household, ruled over by the painter's jealous, eternally pregnant wife and his taciturn mother-in-law. At times the relationship between servant and master seems a little anachronistic. Still, Girl with a Pearl Earring does contain a final delicious twist. 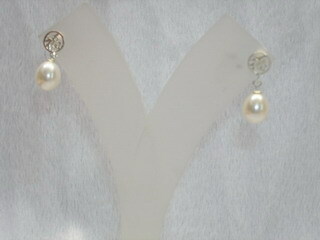 You can buy the similar freshwater pearl earrings.